Mosaic Academy was founded by parents and instructors who felt that something more was needed than what is presently available in public, private, and home-school settings. For seventeen years we have personally experienced how the unique, active learning based classrooms and parent-instructor partnership enables the family to thrive on their educational journey in a home-school setting and at school. Partnership is an intentional word, both shaping our method of education and distinguishing us from other options. Most conventional, full-time schools value “parent involvement” in the educational process. However, in practice, the school assumes the primary responsibility for meeting each student’s developmental needs. Conversely, in most home-school co-ops, the responsibility is placed mainly upon parents while the co-op provides a selection of electives and socialization opportunities for the children. At Mosaic Academy, our parents are entirely engaged in their children’s education. Rather than merely supplementing home-school curriculum, we fully collaborate with parents in customizing a complete educational plan that meets the unique learning needs for each student. Mosaic Academy is formed by families who want the rigor and accountability of a private education and full involvement in their child’s learning as full-time home-educators. We long to see every student successful in the learning process, and we understand that each student learns uniquely. Our team of professional instructors partner with parents to see that the assignments are meeting the student’s educational needs. Each teacher is committed to working with each family to find the keys to success for each child in the classroom and at home. This instructor-parent partnership energizes each student’s learning with high quality education and the nurture of home school environment..
Mosaic Academy supports each home-schooling parent by carrying the burden of planning and by providing a structure for accountability that empowers each home-educating family to meet their educational goals each year. Our instructors rely upon their teaching experience and knowledge of educational research to creatively introduce concepts in the classroom. Our parents reinforce these concepts by guiding their students through daily activities and homework assignments. Through careful observation and loving support, parents are uniquely able to identify their child’s learning patterns, strengths, special interests, and any conceptual difficulties that may emerge as they engage in the educational process. By providing timely and thorough feedback to partnering instructors, each student’s interests are cultivated and unique learning difficulties are quickly addressed. Mosaic Academy also partners with parents in nurturing their children’s faith. We consider this to be both one of our greatest joys and responsibilities. We believe that spiritual formation is an essential aspect of a complete education. Mosaic Academy is a Christian school and we speak openly about God’s personal role in our daily lives. Our goal in our instruction and correction is to help each of our students develop a life that models that of Christ. While many Christian schools offer courses in Bible instruction, our approach to discipleship is relational in nature and emerges organically in the learning environment. Spirituality is integrated throughout our curriculum and each of our instructors includes a devotional time in planning the school day. Through these efforts, we seek to foster a learning community that enriches spiritual development and fosters loving social skills. In our classes we will speak of God as Creator, Jesus as Savior, and Holy Spirit as Counselor and Guide. Our Bible classes we will not spend time debating theological differences or Christian practices, but we will set our focus on conforming to the image of Christ, our Lord, as we seek to help our students develop the character of Christ. We believe that God is the Creator of the earth and all that is in it. We believe Jesus Christ is His only begotten Son. We believe in the virgin birth. We believe in the Holy Spirit and in His active presence in our daily lives as Comforter and Guide. We believe in the Father, Son, and Holy Spirit – three in one. We believed that Jesus Christ was crucified, died, buried, and the third day He rose from the dead. We believe He ascended into heaven, and is now Lord of heaven and earth. We believe that Jesus has paid the way for the forgiveness of our sins through His death and resurrection. We believe that those who have given their lives to Christ will spend eternity in Heaven with God. We believe that the Bible is inspired by God and is profitable for doctrine, reproof, correction and instruction in righteousness. Our curriculum is selected with the whole child in mind and is implemented in our classrooms in a way that transfers naturally between school and home for strong success in your home-schooling. We use each text as a springboard for active learning in order to create and atmosphere for student engagement, ownership over learning, success, creativity and fun. We have selected from a variety of curriculum sources and carefully review our choices on a consistent basis to ensure their effectiveness in creating a well-rounded student. Some of our curriculum choices are: Bob Jones University Press (BJU) Math and Science, Apologia Science, Modern Curriculum Press, Shirley Grammar, Handwriting Without Tears, Abeka Phonics, Making Words, McGraw Hill History, Story of the World volumes 1-4. Mosaic Academy is delighted to welcome your family to our school community. We are grateful that you are interested in partnering with us as we, together, seek to educate your students. Mosaic Academy has open registration year round based on availability in our classrooms. We do maintain small class sizes and close our classes at 10-12 students for most ages. Please note there is a fifteen day application process. You will be notified of the status of your students enrollment within those fifteen days. Your registration fee is due upon submission of your application. You will receive a tuition invoice via email upon acceptance of enrollment. Tuition invoices are usually emailed a week prior to the first of every month. 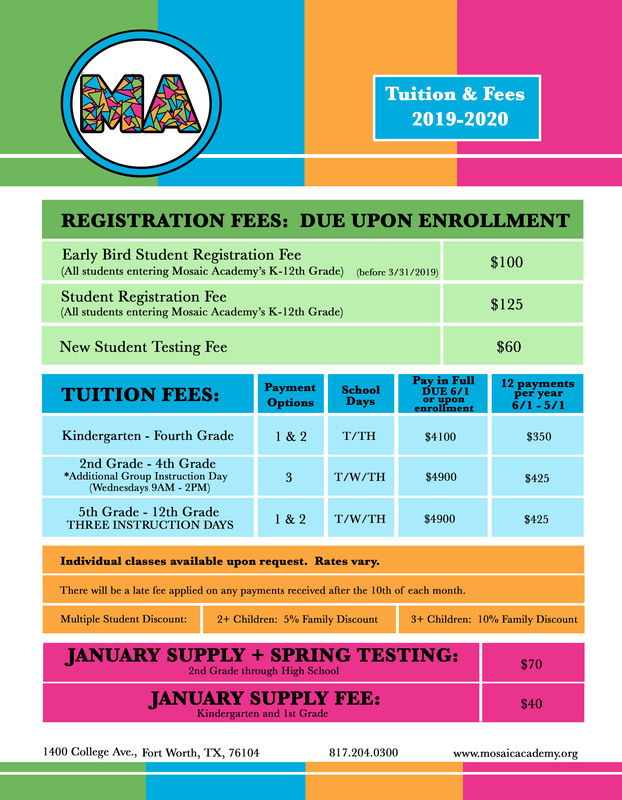 Tuition payments are due on the first of every month. Note: If our classes are at capacity, your student will be added to our waitlist and we will hold registration amount until a spot becomes available. You will have the option of a registration fee refund if you choose to remove your student from our waitlist, or if a spot does not become available. We may be able to offer classes for students on our waitlist on alternate days such as Monday/Wednesday as an alternative. Our Tuition and Fees can be found here. Our online applications can be found here. (Optional Wednesday: Limited Availability) 9:00 a.m. – 2 p.m.
Tuesday/Thursday 2:00 p.m – 3:30 p.m.
Tuesday: 9:00 a.m. – 3:40 p.m.
Thursday: 9:00 a.m. – 3:40 p.m.
Wednesday Group Tutoring: 9:00 a.m. – 2:00 p.m.
Tuesday: 8:30 a.m. – 3:40 p.m.
Thursday: 8:30 a.m. – 3:40 p.m.
*Community service jobs are from 3:30-3:40: every student participates in caring for our space and work as a team to tidy each learning area. Our academic schedule for all students includes Math, Language Arts, Spelling, History, Science, Physical Education, Computer, Spanish Conversation, and Music. We have several additional elective courses that are new to Mosaic Academy for the 2018-2019 academic year. They include yoga, group guitar lessons, ballet, and art classes. Prices vary for each class. Please contact the school office with questions. Can my student take individual classes? Individual academic classes are available as space permits. Individual classes are paid for per semester. Applicable supply fees are due upon enrollment. How much time is required for homework on non-class days? Mosaic Academy provides a full course of study for each grade. Each student who completes the assigned work is prepared to move into the next grade at the end of the school year. For this reason, each student should expect a full day of homework on non-school days. An average amount of work is forty-five minutes to an hour per subject. Do have a break time for lunch and recess? We believe movement is critical to successful learning! For this reason we have a morning break time and a 30-minute lunch break for students in Kindergarten through sixth grade, as well as a PE class each school day. Middle/High School students have a 10 minute break in the morning, and a 30 minute lunch period, as well as a PE class. What is covered in the materials fee? The non-refundable materials fee covers the cost of all of your student’s books for the year. It also includes the cost of copies and other materials that are used in class each school day. Consumables become the property of the student. Hard backed books remain the property of the school and are used multiple years. Mosaic Academy is pleased to offer a computer class that familiarizes students K-12th with using technology for today’s world. Beginning students interact with KIDPIX™ and learn the basic functions of a computer. Starting in third grade, students are taught proper finger placement to develop good typing skills. Upper grade students continue typing practice with Mavis Beacon Typing Tutor™. Students create presentations using PowerPoint, Microsoft Word, Excel, KIDPIX™, and web resources. They also learn web safety practices. We offer an interactive music class for students through the eighth grade. Students learn rhythm, and movement, choral techniques, as well as beginning skills that help them to appreciate the beauty of all types of music. We also offer opportunity to develop skills in dramatic presentation and produce a school musical every year. Is Bible taught in the classroom? Each class begins their class day together with Bible class. We use a variety of Scripture and character focused curriculum in our Bible discussions each day. Students have weekly and monthly Scripture memorization assignments. Does Mosaic Academy combine more than one grade in a classroom? Yes. Depending on enrollment we often combine grades such as a first and second, third and fourth, and so on. We ensure that each grade is allotted sufficient time for their concepts. We have found that mixed age levels promote student learning both by adding a variety of perspective to discussions and by using co-operative learning and peer tutoring. Would you like to hear what people have to say about Mosaic Academy? Click the button below to head over and see our reviews on Great! Schools. We enrolled our six year old son this year because we were looking for a place that he could learn at different grade levels like he has in home school. His teachers are phenomenal! He is in two different grades, working on 2nd and 3rd grade material at school, and bringing home a great curriculum to challenge him. He's quite busy and we were concerned with sending him anywhere, but his teachers have helped bring him along and push him to be his best. He loves going to school and has a great time with his friends doing all the activities. Such a loving, positive environment that also challenges my children academically. Love this little hidden gem in Ft Worth! Our family loves this school! It allows us to homeschool three days per week and private school two days. I love that my children get the best of both worlds. We homeschool the way we want and we also get the experiences from the school that we would be missing out solely homeschooling, like choir, drama, computer class, Spanish immersion, P.E., etc.. Both of my children look forward to going to school every Tuesday and Thursday. It has also helped us a lot in our homeschool work to stay on track, and has helped me have accountability with the school to not fall behind. In fact, Mosaic Academy has helped us overcome many obstacles in our homeschool and now my kids are reaching above and beyond their current grade levels. The MDO (Mother's Day Out) and PreK teachers are so sweet and caring and gentle - my daughter adores her teachers this year and last, and talks about them all the time when we are home. My son has grown so much these past two years in the Upper School. The teachers are lovely, compassionate, caring, and kind and work to push the kids to reach their full individual potential. We are so pleased here at Mosaic! It also has taken such a weight off planning and prepping our homeschool schedule and activities. Everything is prepared for us - it's just wonderful. The kids get to participate in group and community activities they never before would have had the opportunity before. We love the small classroom setting: it is incredibly hands-on and I as a parent especially appreciate the one-on-one teaching opportunities both of my children receive. I know I can trust the school to homeschool on an individual level my children would be receiving at home. The kids build very strong friendships and so do the parents! We have friends that we see consistently and have built strong, christian relationships with like-minded peers. This school is the best thing that's happened to us. We HIGHLY recommend Mosaic Academy! My two grandchildren attend Mosaic. I have not worked as much with the younger one (still in pre-K), but have done my share of home schooling days with the older one (finishing second grade this month). I am a retired public school teacher of 30 years, and it has been a pleasure to see my grandson improve tremendously since attending Mosaic. Before attending, he griped and grumbled every time he had to do school. Now, with two classes a week outside the home, he sees that everyone has to do school, and it is less of a battle (I won't pretend that he loves homework). He really enjoys completing the assigned projects and presenting them to his class. His first year and a half of home schooling was begun with a different curriculum, which introduced reading at a later age; his standardized testing given last May at Mosaic showed his reading level to be very low, which made sense since his original curriculum didn't teach reading until age 8. With the small classes available at Mosaic, and individualized attention and work given by his teacher, he tested completely on level for an end of year second grader this May. So, in one year at Mosaic, his reading level came up two and a half years. That alone is amazing! All of his other skills were also either on level or way above. I'd give specifics, but many people know who I am talking about and that wouldn't be right to give out his scores to everyone! But I can tell you that Mosaic focuses on a student's strengths, and capitalizes on them; it also focuses on their weaknesses, and works to improve them. Remember that I was a public school teacher? You seldom see this kind of improvement and individualized attention in a public school; I have been very pleased with the improvement, both social and academic, that Mosaic has brought about this past year. Mosaic academy has been wonderful for our family. My kids have really grown the past two years in this school. The faculty is amazing and are wonderful leaders of Christ and teach through example. It has been a fantastic place for my children to learn and grow. My son loves the extracurricular activities the school offers, and my daughter is beyond thrilled to be part of the Ballet studio. My wife constantly praises the school and I am grateful our family has found a place here with the loving environment, Christ-centered, and educationally focused school. This is our first year at Mosaic Academy and it has been awesome! I have two children here and each child has been accommodated in the ways that particular child needs. Mosaic feels more like family than school and we love it!! This place has given me options I never would have had otherwise. Thanks Mosaic for helping me homeschool and giving my child the best of both worlds! Our daughter has grown so much at this school in the past year! The classes are small and very personalized. We appreciate the intermingling of grades. This is a great opportunity for those that are interested in homeschooling but feel overwhelmed by being completely responsible for your kids education. When our daughter invited me to tour Mosaic with her last year, I had to go. I am a teacher and very concerned about the schools my precious grandchildren attend. She and I both knew immediately that this was the place for her soon-to-be 8th grade daughter. It was the absolutely the right decision! This year has been a joy seeing her grow and learn to love school again. The teachers have been supportive and encouraging when she needed it and firm when she needed that. The curriculum is solid and is presented in a way that both challenges and motivates the students. Our 2-year-old grandson is in the toddler program and loves it! I could not be more pleased with their progress. Thank you, Mosaic!